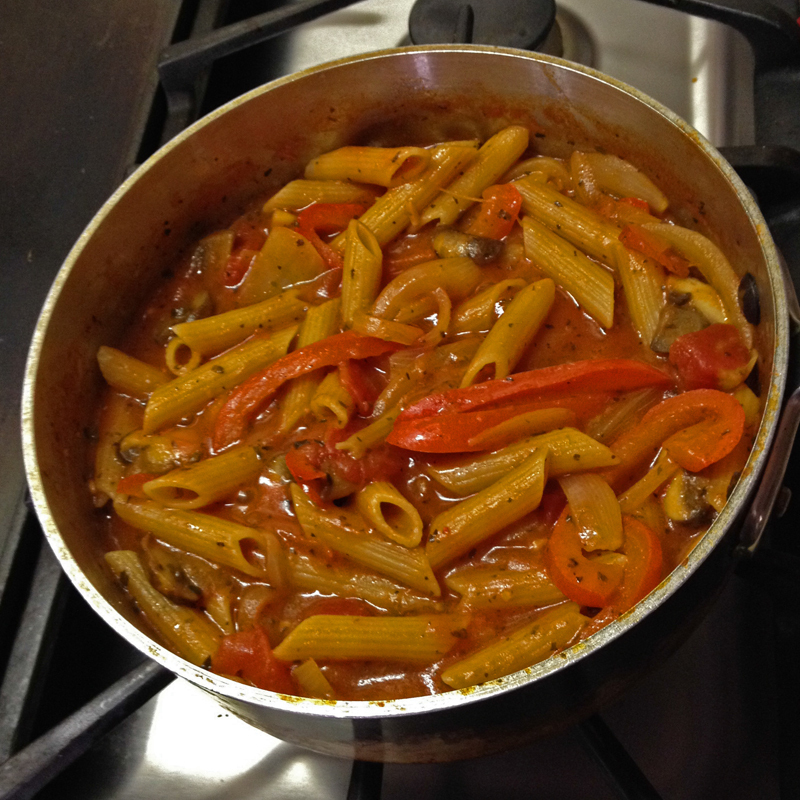 Dinner: Penne Rigate cooking in the sauce. Ugh, I’m alone at home for dinner. A quick look in the refrigerator revealed half a yellow onion, a whole red bell pepper, remains of a jar of Spicy Tomato Pesto Sauce, a mostly empty bottle of Jalapeño Stuffed Olives (marinated in Napa Valley Chardonnay). An extended search yielded a few brown mushrooms and some left-over cooked chicken breast, green leaf lettuce and a bunch of scallions. The pasta drawer yielded organic Cadia Penne Rigate. Dinner was going to be Penne Rigate with Spicy Basil Sauce and a green salad. I sliced the onion, mushrooms and half the bell pepper and added the slices into a hot sauté pan started with olive oil, dried basil, crushed garlic and a few peperoncino flakes. I ate the lone olive left in the depleted jar of Jalapeño Stuffed Olives, and added the Chardonnay to the sauce. 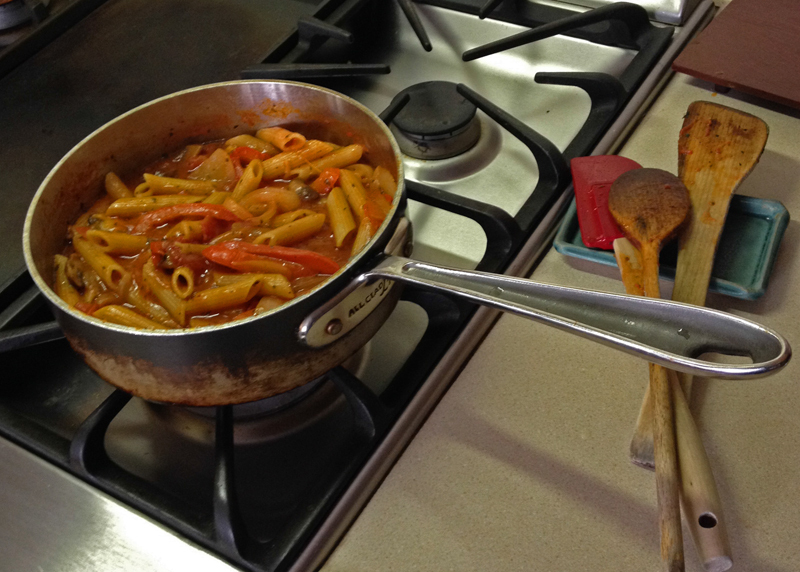 Next, the half jar of tomato sauce and 1 cup of dry penne went into the pan. Finally, I added hot water (about a half-cup) so that the pasta wouldn’t dry out. I put the cover on the pan, turned the heat down and set the timer to 11 minutes. Dinner: Penne Rigate in a Spicy Chardonnay Basil Sauce. While the pasta cooked, I had plenty of time to turn two lettuce leaves and a scallion into a salad (adding, Newman’s Lite Italian Dressing). Desert was a bit of chocolate, a cookie and some fresh cherries from Washington State. This entry was posted in Cooking, Palo Alto and tagged Postaweek, Writing101 by carto. Bookmark the permalink.